Your Evernote account has a secret email address and any email message forwarded to this address is automatically archived as a new note in one of your Evernote notebooks. You can forward PDFs, travel receipts, audio clips, images and other important emails to this email address and they will be archived forever in your Evernote account. You can send emails from Gmail to your Evernote account manually or you can use services like Zapier or IFTTT to automate the task of creating notes in Evernote from your Gmail mailbox. For instance, you can star a message in Gmail and it is sent to Evernote. Or can you apply the label Evernote to a message inside Gmail and IFTTT will forward the message with attachments to Evernote. While it is easy to integrate Gmail and Evernote with the help of external services, a downside is that you would need to grant full access to your Gmail mailbox to a third party service. If you are not happy doing that, there’s an alternate solution that uses Google Sheets and it can be implemented in less than a minute. 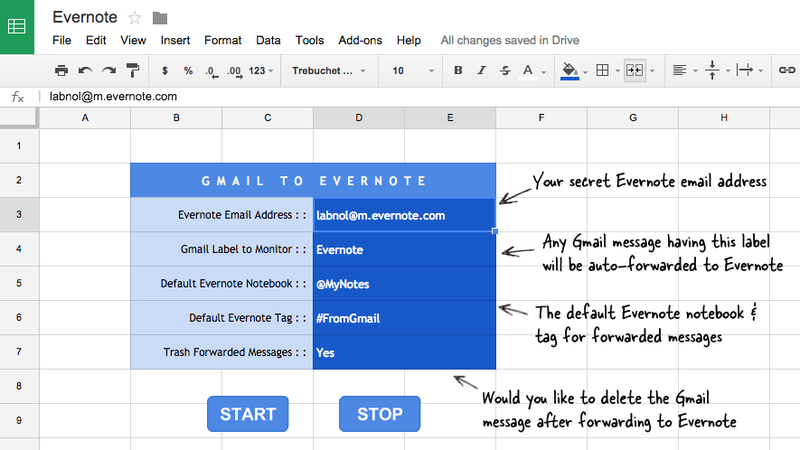 Click here to copy the Gmail to Evernote spreadsheet in your Google Drive. Put your Evernote email address (help) and other values in column D. Refer to the illustrated screenshot for details. Now click the Start button, authorize the script and it will run in the background. Close the sheet and any messages in Gmail with the label Evernote (cell D4) will be sent to your Evernote in specified notebook and tag. That’s it. The script is open-source and no third-party has access to any of your Gmail or Google Drive data. You can also consider using the Bulk Auto Forward tool for automated sending to other email based workflows like Kindle, Instapaper, Salesforce, WordPress and so on. Later, if you wish to stop the Google sheet from forwarding your Gmail messages to Evernote, simply click the Stop button. Also, please note that you should only specify tag and notebook names that already exist in your Evernote. If they do not existing, the email will get saved in your default Evernote notebook. See more Evernote tips & tricks.